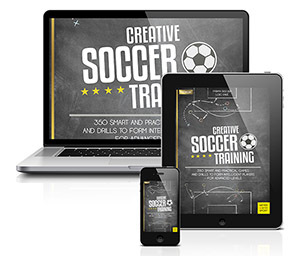 Chasing and Capturing includes training exercises to improve individual and group tactical defensive behavior with the goal of winning the ball, and with offensive transition actions. Here emphasis is placed on facilitating a basic attitude and mentality. This basic active defensive attitude includes the permanent chasing and confronting of the opponent, applying constant pressure on the player in possession, and ﬁnally the objective of touching the ball and getting it under one’s own control. Players must have passion, dedication, assertiveness, and toughness in tackles. Beyond that players should act as a group, coordinate with each other, and use intensive pressing as the situation demands. Mutual assistance via coaching and communication as to the start of pressing must be clearly deﬁned and can depend on the opponents and correspondingly designated pressing victims, bad ball handling, or closed body position. A successful ball capture is followed by follow-up actions like dribbling, passing, or shots on goal and corresponding transitions to create scoring opportunities on offense, or safeguarding the ball within their own ranks on defense. The training exercises include versatile games of catch and ball-capturing games with different superior and inferior number ratios. This requires ﬂeet-footed running movements with intensive sprinting, different directional changes, and situation-appropriate running feints. 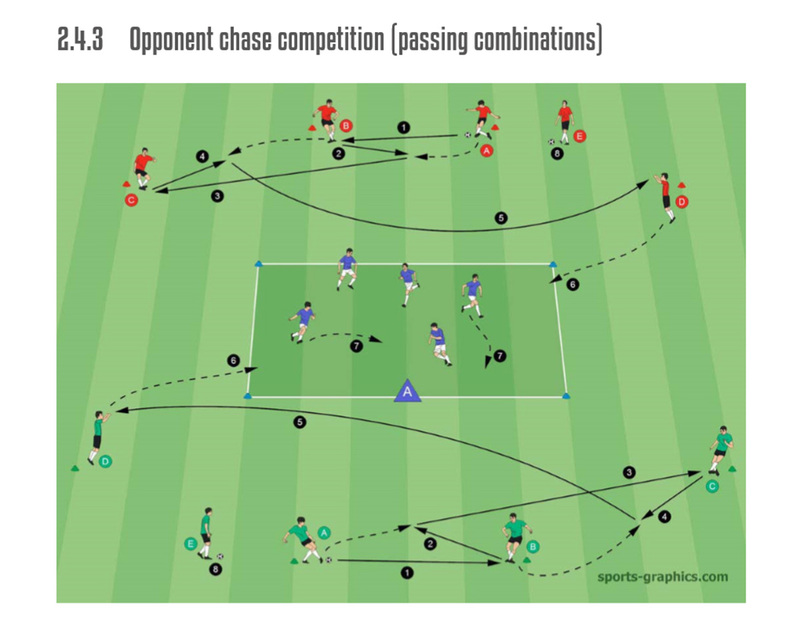 Within the scope of these catching and capturing games, winning the ball is further organized based on opening techniques in the form of passing combinations, dribbling, ﬁnishing, and provoked turnovers. Players are divided into three teams (see WHITE, BLUE, and GREEN teams). Two teams (see WHITE and GREEN) spread out on the two ﬁelds. The third team (here the BLUE team) plays with an inferior number and positions itself outside between the two ﬁelds. The players from the WHITE team and GREEN team move around their ﬁelds without a ball. The BLUE team players play in a group of three with an inferior number and chase the opposing players, trying to touch one of them by hand (see 1 and 2). The chasing team has 10 seconds to do so. If the chasing team (here the BLUE team) manages to touch a player within the allotted amount of time, the tasks switch. This means three players from the touched player’s team must chase on the other ﬁeld. The team that was previously able to touch a player remains on the played-on ﬁeld. If the other chasing team (here the BLUE team) is unable to tag a player, three new players from the BLUE team sprint onto the other ﬁeld and there try to catch a player within the allotted amount of time (see 3). The three previously active players take over the waiting position and must chase again. Vary the intensity (change of ﬁeld sizes, timing, and time limits). Players are divided into three teams (see GREEN, BLUE, and RED teams). Two teams position themselves outside, each at four cone markers (see GREEN team and RED team). The third team (here the BLUE team) positions itself on a center ﬁeld (see ﬁeld A). The GREEN and RED teams compete against each other and one player from each team (see player D) tries to chase a player from the BLUE team on the center ﬁeld according to a predetermined passing sequence. After a signal from the coach, the players A from both teams simultaneously begin the passing sequence. Player A passes to player B (see 1), follows his pass, and receives a back pass (see 2) from player B. Player A plays a long pass to player C (see 3). Player B pivots and receives the back pass from player C (see 4). Player B settles the ball and plays a volley to the far player D (see 5). Player D catches the ball and sprints with the ball in hand to the center ﬁeld (see 6). The players D from the GREEN and RED teams now try as quickly as possible, and in front of their respective opposing catcher, to chase a player from the BLUE team and touch him with their own ball (see 6). The BUE team players try to escape the catchers via running paths ﬁlled with feints (see 7). The ﬁrst catcher to tag a player from the BLUE team scores one point for his own team. As soon as a player from the BLUE team has been tagged both players E begin a new action (see 8). The previously active players A, B, and C now move up one position for the next round. After a chasing team has tagged a predetermined number of players, the tasks switch and another team positions itself on ﬁeld A. Compete while dribbling with ball at foot (player D and player from BLUE team with own ball).